If you want to help your neighborhood, you should pick up this book as a guide. We must reclaim our neighborhoods and provide a new blue print of opportunity for our citizens to follow instilling family values, confidence and acknowledgement of our youth. Dance is the vehicle, but the training will address the issues we face as a society and what to do about it. The book can be used as a reference guide to help transform any City. It can also be used as reference material for any parent to develop teams in the home, and for any boss to create teams of employees. I came from a gang rich city; Richmond, California. Dance and support groups gave me a new outlook and a new life. I have a story to tell, read this book and become enlightened, go through my program and be transformed. If you want to help yourself be a better, productive contributor to society, please read this book. How can this be done...by Ballroom Dancing...In Ballroom Dancing, it is a discipline that requires cooperation between a Boy and a Girl. The objectives are to learn the skill of dancing through working out the rules of being a great partner and team player, while also helping you find purpose in life and thrive in your social life. 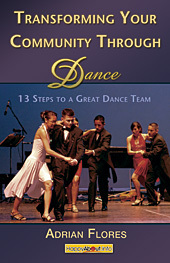 The common bond of dance is enhanced when you implement social skills, etiquette training, and intelligent relationship practices. After you read this book, you will discover the productive and the counter-productive communication skills to create great relationships. Adrian Flores was battered as a child. In 5th grade he joined his first gang, then got married early, got involved in politics in the 60's, became an alcoholic and a drug addict. He quit drinking and using drugs, went to support groups and therapy, trained to be a dancer, competed-won and lost and now has something to give back his community. His story needs to be told as well as use the vehicle he's created to help families and communities thrive in a world of dance. Mr. Flores was a U.C. Berkeley student - School of Architecture, Community Relations Specialist for the City of Richmond and a technical assistant to the Board that made recommendations to the City Council regarding City run Federally funded programs, a Vacuum Cleaner Salesman and Sales Trainer, a Ballroom Dance Teacher, Competitor and Theater Arts Champion, a Ballroom Dance Studio owner, Dance Show Producer, and is now a coach for kids-Retrain the thinking process through Dance.